Bing is a web search engine launched by Microsoft in June 1, 2009. Like Google Webmaster Tool Bing also have Bing Webmaster Tools. Bing Webmaster Tools provides free service for managing your site using Bing. For managing site using Bing or for Bing webmaster verification we should have a Microsoft account just go and signup. After creating account then we have to add our website or blogger to Bing webmaster tools. Add our website to Bing Webmaster Tools by entering the URL of our site and click the add button then adding our sitemap address. In this step verifying the ownership means verify that you are the owner of the website. Mainly 3 kinds of methods to verify the ownership. 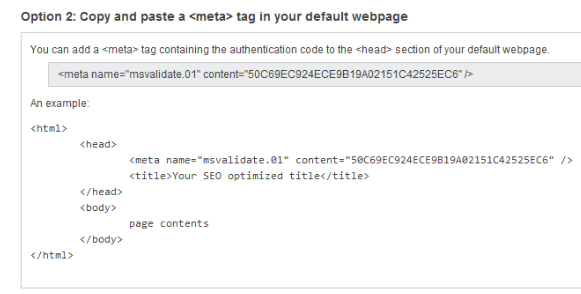 Here we use the 2nd option that means Meta tag authentication. Copy the displayed meta tag and go to our registered sites homepage then click tools and submenu available tools then open a window and then paste the meta tag to appropriate Bing webmaster tool input box. Then click the verify button. If Bing Webmaster Tools verity our site then we can see the green check mark. Otherwise we can see a red check mark. We can also add Blogger to Bing Webmaster Tools. Here also the same process of website.1st sign in our Microsoft account then entering the URL of our blogger and add site map also. Then verify the ownership by using any of the 3 options. Here we also copy the Meta tag and open our blogger and go to layout menu then we can see the HTML edit box .click that box and paste the Meta tag before closing head tag. Save that HTML section and click the verify button. After the verification we can see our site and blogger in the Bing dashboard. How Will a blog help website in SEO? 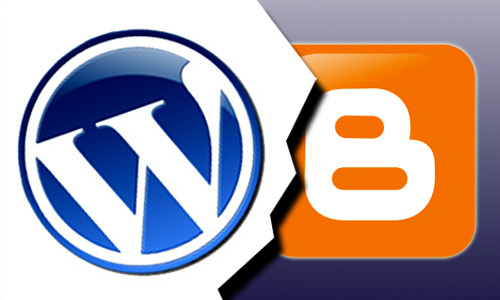 Blogs are highly helpful for website in SEO. But installation or creation of a blog does not guarantee any SEO improvements. If the blogs is regularly updated with new posts, with fresh content, relevant topics, the website site will surely get improvements in its search engine ranking. A website with regularly updated blog keeps the website changes regular and the crawling process will also bring certain impulses to its overall improvement in search engine ranking, authority, trust, traffic ranking, more organic visits etc. If a website get crawled by search engine robots regularly and the spiders found there is a regular updation of content, text, images, the website will surely get some plus marks for its regular updation. For a website created for business and branding purpose, regular changes in content, text, images etc are not a silly matter. If the website is made in a static manner, it is really a big task to change it regularly. There are several benefits a website can achieve through blogging. Blogs can keep the websites lively. Especially if there are periodical posting or publishing of new URLs in the form of tips, articles, awareness etc it can keep the feed rate of website in a lively manner. If the posts published in the blogs are in a well optimized manner to be listed in Google, popularized and promoted via social media websites book marking website, it can bring comments, more responses, social signals branding etc. to the website. Once the published blog posts are getting more comments, get noticed by many online audience, it crawl and cache rates of the website will periodically improve. It will boost up the traffic ranking, search engine ranking authority, trust value, page rank etc of a website.